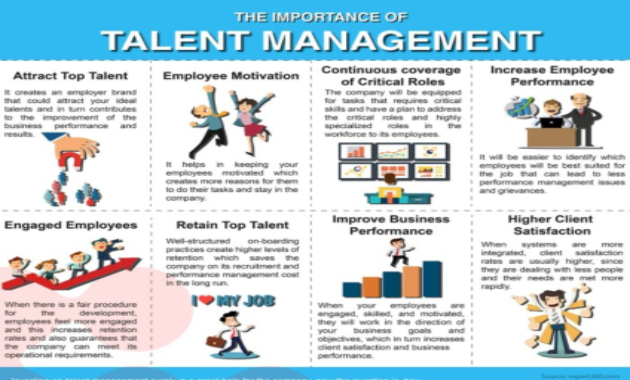 Talent management is not just a simple human resource key term one will come across. It is also committed to hire, manage, develop, and retain the most talented and excellent employees in the industry. In fact, talent management plays an important role in the business strategy since it manages one of the important assets of the company—its people. That is why companies should make the effort to effectively manage the employees to help them develop their skills and capabilities in order to retain them. Here are some reasons why companies should invest in talent management. Attract top talent Having a strategic talent management gives organizations the opportunity to attract the most talented and skilled employees available. It creates an employer brand that could attract potential talents, and in turn, contributes to the improvement of the organizations’ business performance and results. Employee motivation. Having a strategic talent management helps organizations keep their employees motivated which creates more reasons for them to stay in the company and do their tasks. In fact, 91 percent of employees shared that they wanted more than just money to feel engaged and motivated, as revealed by Chandler and Macleod’s survey. Continuous coverage of critical roles. Talent management equips companies with the tasks that require critical skills to plan and address the important and highly specialized roles in the workforce to its employees. This means that the company will have a continuous flow of employees to fill critical roles to help companies run their operations smoothly and avoid extra workload for others, which could lead to exhaustion. Increase employee performance. The use of talent management will make it easier for the companies to identify which employees will be best suited for the job that can lead to less performance management issues and grievances. It will also guarantee that the top talent within the company stays longer. Engaged employees Talent management allows companies to make systematic and consistent decisions about the development of staff, which guarantees the employees’ skills and development. Furthermore, employees will feel more engaged when there is a fair procedure for the development, which helps in increasing the retention rates that helps companies in meeting their operational requirements. Retain top talent. Well-structured on-boarding practices create higher levels of retention which saves the company on its recruitment and performance management cost in the long run. Improve business performance. Talent management helps employees feel engaged, skilled, and motivated, allowing them to work in the direction of the company’s business goals, which in turn, increases client satisfaction and business performance. Higher client satisfaction. A systematic approach to talent management means that there is an organizational integration and a consistent approach to management. When systems are more integrated, client satisfaction rates are usually higher, since they are dealing with fewer people and their needs are met more rapidly. Investing in talent management surely is a great help for the company, now the question is, how will companies implement it? Genie Technologies Inc., (GenieTech) will be glad to help companies with their needs regarding talent management and other HCM features. GenieTech’s Ramco is a comprehensive hire to retire HCM software designed to facilitate a changing work environment. It simplifies HR strategy for innovation-centric companies to automate traditional HR transactions and drive business benefits across functions. With Ramco, companies can focus on their people and not spend time navigating around systems or worrying about future changes. "Stand by what you believe in, but be quick to admit your mistakes," affirms award-winning researcher and professor of leadership,..